NYPD Det. 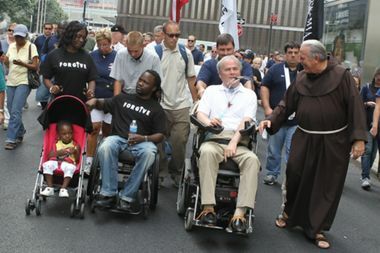 Steven McDonald (white shirt) shares a moment with FDNY Chaplain Christopher Keenan as the Memorial march for Father Mychal Judge passes by Ground Zero on Sept. 4, 2011. MANHATTAN — Tributes poured in for beloved NYPD Det. Steven McDonald, who died Tuesday afternoon after his family removed him from a life support respirator he has used since he was paralyzed 30 years ago by a gunshot. “Det. McDonald, 59, who loved cops/community/life & NY Rangers, has passed (and) source of inspiration & incredible hope to people the world over,” Police Commissioner James O’Neill tweeted after McDonald died in a Long Island Hospital. McDonald, who famously forgave the teen who shot him, inspired countless people by exhibiting a life filled with compassion rather than hatred or self-pity. He suffered a massive heart attack last Friday that left him unconscious. On July 12, 1986, McDonald, then an officer for just two years, was trying to stop robberies in Central Park when he was shot three times by 15-year-old Shavod Jones. One of the bullets hit McDonald in the neck, leaving him paralyzed from the neck down. Michael Palladino, the detective union president, said McDonald “was in a category by himself as a human being” who reached out to the teen who crippled him “to transcend that hatred and publicly forgive him." Police sources say McDonald's death will likely be ruled a homicide since it apparently stems from being shot in the line of duty 30 years ago. Doctors initially gave him only a few years to survive. The ruling, however, will have no appreciable meaning in the case because Jones died in a motorcycle accident in 1995 shortly after he was freed from prison. McDonald followed his father, David, and grandfather into the NYPD. He is survived by his wife, Patti Ann, and son, Conor, an NYPD sergeant. “Like so many cops, Steven joined the NYPD to make a difference in people’s lives,” the NYPD said in a statement. “And he accomplished that every day. He is a model for each of us as we go about our daily lives. He will be greatly missed, and will always remain a part of our family." McDonald's wake will be held Wednesday and Thursday at St. Agnes Cathedral in Rockville Center, Long Island. His funeral will take place Friday at 9:30 a.m. at St. Patrick's Cathedral in Manhattan.